This is possibly the biggest change to sprockets and hubs that karting has seen in the last 20rnyears and is without doubt the first of its kind worldwide. 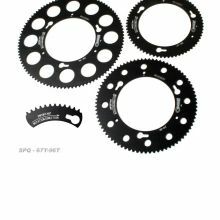 DPE have spent many hoursrndeveloping, testing and refining a sprocket and hub combination that is simple, fast and easyrnto use. This new system allows you to remove and change a sprocket in 1/5th of the timerncurrently taken to change a standard sprocket. Back to 219 Pitch product list.